NGO Monitor is one of those nasty little Zionist McCarthyite organisations that was set up to try and stifle the Palestinian message to the West. It is no accident that it has targetted the funding of Electronic Intifada, in just the same way as the Israeli government is targetting the activities of any NGO that opposes their brutality in Israel itself. The Israeli state hates opposition and Electronic Intifada is the most coherent and persuasive of its opponents. Having written a couple of articles myself for EI I can state, without hesitation, that its process of approval of articles is rigorous and academic, indeed more exacting than some journals. It is no ordinary blog. The defence of Electronic Intifada is absolutely essential for all those interested in seeing that the case for the Palestinians is spread. NGO Monitor's campaign of public defamation against The Electronic Intifada focuses on support the publication receives from a Dutch foundation. 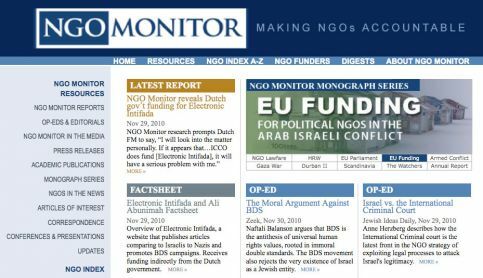 NGO Monitor has launched a campaign targeting a Dutch foundation's financial support to The Electronic Intifada, accusing the publication among other things of "anti-Semitism." NGO Monitor is an extreme right-wing group with close ties to the Israeli government, military, West Bank settlers, a man convicted of misleading the US Congress, and to notoriously Islamophobic individuals and organizations in the United States. NGO Monitor's campaign of public defamation against The Electronic Intifada has focused on a grant the publication receives from the Dutch foundation ICCO. 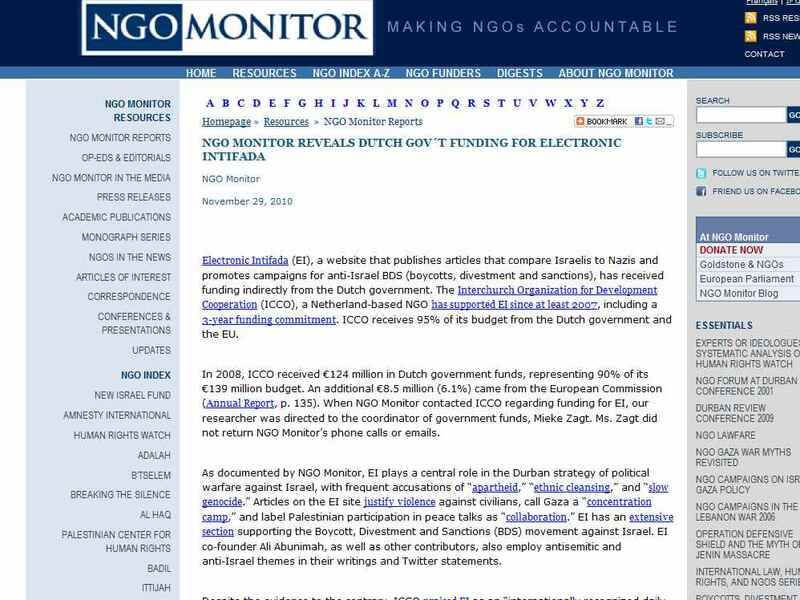 NGO Monitor has pressured the Dutch government, which subsidizes ICCO, to end its support for The Electronic Intifada. Dutch Foreign Minister Uri Rosenthal has apparently already lent public credence to NGO Monitor's campaign against The Electronic Intifada, an independent publication established in February 2001 and read by thousands daily. NGO Monitor's attack on The Electronic Intifada is part of a well-financed, Israeli-government endorsed effort to silence reporting about and criticism of Israel by attacking so-called "delegitimizers" -- those who speak about well-documented human rights abuses, support boycott, divestment and sanctions (BDS), or promote full equality for Palestinians. Last February, The Electronic Intifada reported that a leading Israeli think-tank had recommended a campaign of "sabotage" against Israel's critics as a matter of state policy ("Israel's new strategy: "sabotage" and "attack" the global justice movement," 16 February 2010). NGO Monitor has already been at the forefront of a campaign to crush internal dissent by Jewish groups in Israel that want to see Israel's human rights record improved. The Jerusalem-based organization poses as a project concerned with accountability for nongovernmental organizations (NGOs), but as Israeli human rights activist and journalist Didi Remez has stated, "NGO Monitor is not an objective watchdog: It is a partisan operation that suppresses its perceived ideological adversaries through the sophisticated use of McCarthyite techniques -- blacklisting, guilt by association and selective filtering of facts" ("Bring on the transparency," Haaretz, 26 November 2009). In a 6 November article in The Jerusalem Post, NGO Monitor president Gerald Steinberg revealed that his group was part of a new "Israel Action Network" established by the Jewish Federations of North America (JFNA) and the Jewish Council of Public Affairs (JCPA) ("Turning the tables on BDS," The Jerusalem Post, 6 November 2010). The JFNA is funding the Israel Action Network to the tune of $6 million over the next three years to target "delegitimization," which according to JFNA president Jerry Silverman, "Israeli leaders identify ... as the second most dangerous threat to Israel, after Iran's pursuit of nuclear weapons ("Federations, JCPA teaming to fight delegitimization of Israel," JTA, 24 October 2010). NGO Monitor's and the Israel Action Network's goals appear to be nothing less than to shut down independent media such as The Electronic Intifada, as well as human rights advocacy groups in Israel, the occupied West Bank and Gaza Strip and around the world. In his 6 November article, Steinberg specifically named The Electronic Intifada and its co-founder and executive director Ali Abunimah, as well as Sabeel, the Palestinian Christian ecumenical justice and peace movement, and its founder Reverend Naim Ateek, as targets of the campaign. Steinberg explained, "To emerge victorious in this political war, the [Israel Action] network must be armed with detailed information about the opposition, and implement an effective counterstrategy on this basis. This involves distributing information to college students and active community members, so they can name and shame the groups that lead and fund demonization." Steinberg goes on to boast, "NGO Monitor has demonstrated that this approach can be very effective. Based on detailed research, the government of Canada cut funding ostensibly provided for human rights and development, but which was actually used for hatred and incitement. Similar discussions are under way in European governments regarding funding for some of the more poisonous NGOs involved in BDS." 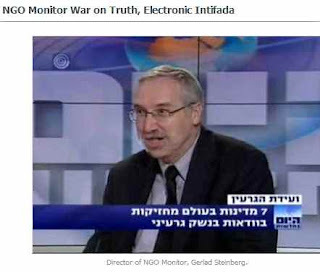 In becoming the latest target of NGO Monitor's defamation and sabotage efforts, The Electronic Intifada joins previously targeted organizations including Amnesty International, Doctors Without Borders, Human Rights Watch, Adalah, Al-Haq, Mada al-Carmel as well as Israeli groups such as B'Tselem, Breaking the Silence, HaMoked and New Israel Fund, among dozens of others. NGO Monitor -- as a glance at its publications reveals -- characterizes any documentation of, or call for an end to Israel's systematic human rights abuses, violent colonization of the occupied West Bank including Jerusalem, or its siege and amply documented war crimes and crimes against humanity in Gaza as "hate," "incitement" and/or "anti-Semitism." In 2007, NGO Monitor began targeting the Canadian international development and human rights organization Alternatives which did development work in the occupied West Bank and Gaza Strip. After a determined campaign by pro-Israel advocates, Canada's Conservative government cut funding to Alternatives and several other groups that worked on Palestinian rights ("Canada's neoconservative turn," The Electronic Intifada, 26 February 2010). Earlier this year, Canada's government-supported International Development Research Centre canceled research grants to Mada al-Carmel -- an independent research center in Haifa, the only one of its kind in Israel, which focuses on the rights, needs and future of Palestinian citizens. According to the Israeli daily Haaretz, the grants which were for research on "Arab political participation in Israel and the future of Israeli democracy," and "Palestinian women in Israel and the political economy" may have been canceled under pressure applied by the Israeli foreign ministry on the Canadian government ("Did Foreign Ministry lobby to stop Canadian funding of Israeli Arab group?," Haaretz, 19 August 2010). On 26 November, The Jerusalem Post published an article by Benjamin Weinthal headlined "Dutch will look into NGO funding of anti-Semitic website." According to Weinthal, "The Dutch government has been funding the Interchurch Organization for Development Cooperation [ICCO], a Dutch aid organization that finances the Electronic Intifada website that, NGO Monitor told The Jerusalem Post on Thursday, is anti-Semitic and frequently compares Israeli policies with those of the Nazi regime." However, The Post does not cite any specific examples from almost 12,000 articles published by The Electronic Intifada since 2001 to substantiate these lurid accusations. With its reporting and independent commentary, The Electronic Intifada has built a global reputation since its founding, and states on its website that "our views on the conflict are based firmly on universal principles of international law and human rights conventions, and our reporting is built on a solid foundation of documented evidence and careful fact-checking." The Post quotes Dutch Foreign Minister Uri Rosenthal stating, "I will look into the matter personally. If it appears that the government-subsidized NGO ICCO does fund Electronic Intifada, it will have a serious problem with me." If the quotation from Foreign Minister Rosenthal is accurate (which cannot be taken for granted given the errors and false statements throughout Weinthal's article), it should be noted that The Electronic Intifada was never contacted by the Ministry of Foreign Affairs of the Netherlands before the minister apparently went on the record lending support to the allegations made by NGO Monitor. 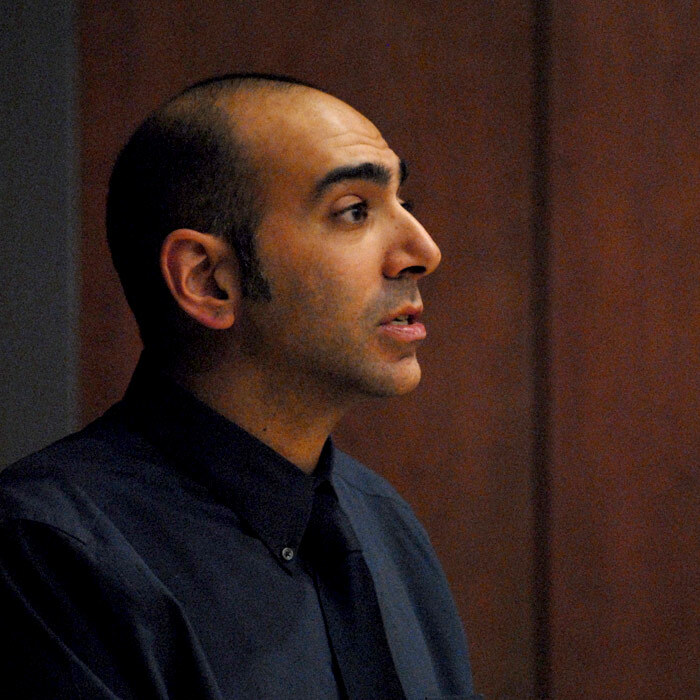 The Jerusalem Post also charges that "EI executive director Ali Abunimah is a leader in delegitimization and demonization campaigns against Israel. In his travels and speaking engagements, facilitated by Electronic Intifada's budget, he calls for a one-state solution to the Israeli-Palestinian conflict and routinely uses false apartheid rhetoric." The Jerusalem Post never attempted to contact The Electronic Intifada or Abunimah to verify any of these claims. Had it done so, it would have been informed that none of Abunimah's speaking engagements or travel has ever been funded by The Electronic Intifada's budget, but all such engagements are paid for by the groups hosting the events which are organized and handled entirely separately from the publication. Since 2006, about one-third of The Electronic Intifada's funding has come from ICCO. The majority of the publication's funding has come from direct donations from readers, and another small part from other private foundations. The Electronic Intifada has never received funds from any government. The Electronic Intifada's total expenses amounted to $149,208 in 2008 and $183,760 in 2009, as reported on the publicly available Form 990 filed annually with the US Internal Revenue Service by the Middle East Cultural and Charitable Society, Inc., the nonprofit organization of which The Electronic Intifada is a program service. NGO Monitor is closely tied to Israel's far-right, its government and military as well as leading anti-Palestinian and anti-Muslim activists in the United States. NGO Monitor states on its website that it is "a joint venture of the Institute for Contemporary Affairs, founded jointly with the Wechsler Family Foundation, and B'nai B'rith International." As The Electronic Intifada reported in 2005, the Institute of Contemporary Affairs at the Jerusalem Center on Public Affairs is a think-tank providing a home for Israel's military and political elite. Among the panoply of Israeli officers who speak and write for the Institute is Doron Almog, who notoriously chose to remain on board an El Al aircraft at London's Heathrow airport and flee back to Israel rather than face a pending arrest warrant for alleged war crimes while he was a division commander in the occupied Gaza Strip ("NGO Monitor should not be taken seriously," 18 October 2005). Among NGO Monitor's International Advisory Board are some unusual choices for an organization focused on accountability. In addition to Alan Dershowitz and Elie Wiesel (who has gone on record saying he can never criticize Israel), there is former CIA chief and pro-Iraq-war activist James Woolsey, and Elliott Abrams. Abrams was convicted in 1991 of withholding information from the United States Congress in the Iran-Contra affair in which he was deeply involved as an official in the Reagan administration. As deputy national security advisor during the administration of George W. Bush, Abrams was the architect of covert US policies intended to overturn the January 2006 Palestinian legislative elections by arming Palestinian militias opposed to Hamas, which had won the vote. Abrams' policies led to a Palestinian civil war that cost hundreds of lives (David Rose, "The Gaza Bombshell," Vanity Fair, April 2008). NGO Monitor's "Legal Advisory Board" includes former Israeli ambassador Alan Baker, who as an Israeli government official spent years publicly defending Israel's violations of international law, including its settlements in occupied territory, which are nominally opposed by all EU governments, including the Netherlands. Cementing the link even more closely, NGO Monitor recently published a joint report with its partner the Institute for Zionist Strategies entitled "Trojan Horse: The Impact of European Government Funding for Israeli NGOs." The Institute for Zionist Strategies, as Didi Remez has pointed out, is led by Israel Harel, a founder of the fanatical Gush Emunim settler movement. While NGO Monitor is increasingly frank that its goal is to shut down open discussion of Israel's human rights abuses, it claims that it exists to promote "accountability" and transparency. But this transparency does not extend to itself or its political allies. Some information is available about NGO Monitor's funding, but the organization does not release the names of all its donors nor the amounts they gave -- even as it insists that others should do so. In addition to the Wechsler Foundation, NGO Monitor lists among its "major donors," Daniel Pipes' Middle East Forum Education Project. Pipes has been widely criticized for purveying anti-Muslim and anti-Arab propaganda, including by United States Senator Tom Harkin (D-Iowa) who opposed Pipes' 2003 appointment by President George W. Bush to the board of the United States Institute for Peace ("Daniel Pipes nomination stalled in committee," The Baltimore Chronicle, 23 July 2003). NGO Monitor also lists a US tax-exempt organization called American Friends of NGO Monitor (AFNGOM) among its "major donors." While AFNGOM received its recognition as a tax-exempt non-profit in early 2009, there was -- as of late 2010 -- still no legally-required, public Form 990 for 2009 available for the group on the Guidestar.org website, the information clearinghouse for US non-profits (According to Guidestar, a 990 should appear on its website approximately two months after being filed). Among AFNGOM's board members is Rita Emerson. Emerson and her husband Steven Emerson are prominent in the US pro-Israel, anti-Muslim community and often make donations to pro-Israel causes. They jointly fund the "Emerson Fellowships" for the anti-Palestinian advocacy group Stand With Us (which works closely with the Israeli military to organize speaking tours for Israeli soldiers on North American college campuses) and are both substantial donors to the Technion Israel Institute of Technology. "Their most passionate concerns include cancer research, the defense of Israel on campus and in the media, and the struggle against the global Jihad," is how the couple was described in the program of a 2007 dinner for the American Freedom Alliance. The Emersons have done very well financially from incitement against Muslims. A recent investigative report by The Tennessean newspaper found that in 2008 Steven Emerson paid his own for-profit company $3.4 million in fees from a non-profit charity he founded, which, according to the newspaper "solicits money by telling donors they're in imminent danger from Muslims." According to The Tennessean, Emerson's non-profit effectively acts as a front for a lucrative for-profit venture ("Anti-Muslim crusaders make millions spreading fear," The Tennessean, 24 October 2010). Unusually, the non-profit's 990 forms do not list any staff, board members or salaries except for Steven Emerson who is the organization's sole officer. Yet a search of NGO Monitor's website found no page dedicated to exposing the lack of transparency of the Emersons' multimillion dollar "non-profit" business. NGO Monitor evinces a similar lack of concern for transparency when it comes to extremist Israeli groups. As Didi Remez points out, "Hundreds of millions of dollars in Israeli taxpayer money and US tax exemptions, mostly hidden from public view, are the driving force of the settlement enterprise," including organizations such as Elad which are behind the current efforts of Israeli settlers to expel Palestinians from certain neighborhoods in occupied East Jerusalem ("Bring on the transparency"). Remez notes that while most of the Israeli dissenting and human rights groups NGO Monitor targets already meet high standards of fiscal transparency, the settler groups do not. Settler groups, Remez observes, "depend on financial opacity for continued operations." NGO Monitor has never said a word about it. With international movements in solidarity with Palestine -- including BDS -- gaining steam, Israel's leaders and apologists are becoming more desperate and unscrupulous than ever. Nothing illustrates this better than NGO Monitor attacking funding sources for media and human rights organizations like The Electronic Intifada and so many other groups doing urgently needed work.